Hackettstown, N.J. – The Hackettstown Recreation Department was the recent recipient of a new defibrillator donated to the town by The Orthopedic Institute of New Jersey. John Mandick from the Hackettstown Recreation Department, pictured third from left, is seen receiving the defibrillator from Dr. Michael Gutkin who is shown representing a number of The Orthopedic Institute physicians. Also pictured (first on left) is Hackettstown resident and Assemblyman, John Dimaio. 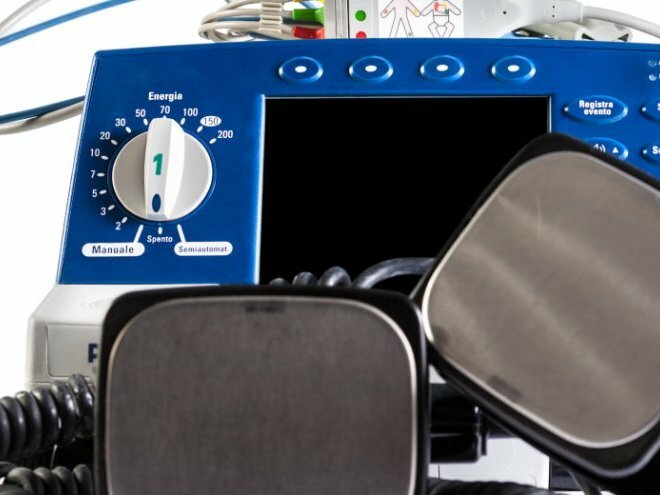 Defibrillation has been proven to be a successful treatment for the life-threatening cardiac arrhythmias, ventricular fibrillation and pulseless ventricular tachycardia. The defibrillator itself delivers a dose of electrical energy to the affected heart which in turn terminates the arrhythmia, and allows normal sinus rhythm to be reestablished by the body’s natural pacemaker. The Orthopedic Institute of New Jersey has provided defibrillators to other organizations and is very glad to do so. Dr. Michael Gutkin commented, “If we can play a small role in saving one life by this contribution, it further supports our work as medical professionals. We were glad to be of assistance to the Hackettstown Recreation Department.” John Mandick of the Hackettstown Recreation Department expressed his appreciation to the Orthopedic Institute of New Jersey. “A defibrillator is an extremely valuable piece of equipment, as we seek to ensure the safety for all those who participate in our programs. We are grateful to The Orthopedic Institute of New Jersey for this donation.” The Orthopedic Institute of New Jersey, www.orthopedicnj.com, is a thriving Orthopedic Surgery and Sports Medicine practice established in 2006. The medical staff specializes in sports-related injuries and disorders, with an emphasis on those involving the shoulder, knee, spine, foot and ankle as well as pain management. The Orthopedic Institute of New Jersey serves Warren, Sussex, and Morris counties with 10 office locations. For more information on The Orthopedic Institute of New Jersey call 1-877-55-ORTHO or go to www.ORTHOPEDICNJ.com.